Mini Sony Playstation 3 Slim - 3D Printed! 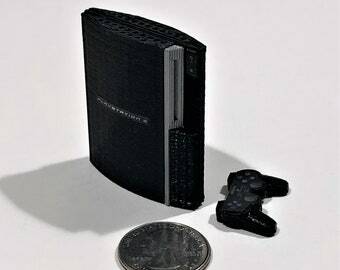 This tiny, 2" Sony PS3 Slim was designed using open source CAD software, 3D printed on a Makerbot Replicator, and hand painted and assembled. Includes the console and one controller. A great addition to your desk or studio. Includes tiny fact sheet with trivia on the original machine. Not suitable for ages 5 and under due to small parts. 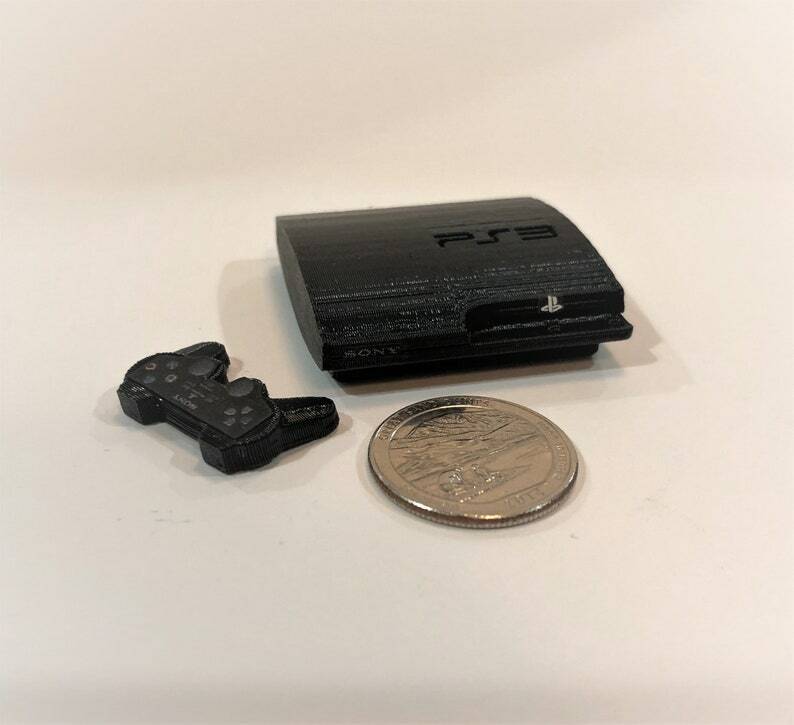 Mini Sony Playstation 2 Slim - 3D Printed! Mini Sony Playstation 3 - 3D Printed! Mini Sony Playstation - 3D Printed! Mini Sony Playstation 2 - 3D Printed! Mini Sony Playstation 4 - 3D Printed! Mini Sony Playstation 4 Uncharted 4 Limited Edition - 3D Printed! Mini Sony Playstation 4 No Man's Sky Edition - 3D Printed! Mini Sony PSOne Deluxe Set - 3D Printed! The TRS-80 3D-printed model shipped amazingly fast even though it was a custom order. Great quality, too. I love it! Mini Commodore 64 Deluxe Set - 3D Printed! Mini Nintendo 3DS XL - 3D Printed! WOW! Unreal...detail is true to the real deal in every way! This will be an awesome gift for my son who grew up learning on the Commodore 64, and has come back to it after over 35 years later...fun! Thank you for bringing this to us via 3D printing! We are happy to discuss custom orders and modifications to our products, but please note that we require payment before the work begins. We have a 100% on-time delivery track record for custom orders. 30 day DOA returns for broken or defective items. We will refund full purchase price on return, excluding shipping. We ship using the US Postal service. Mini Atari 520ST - 3D Printed! Mini Xbox 360 Slim - 3D Printed! Mini Kenbak-1 - 3D Printed! Mini Philips Videopac G7400 - 3D Printed! Mini Atari 1040ST - 3D Printed! Mini Atari 800 - 3D Printed! Mini Commodore C-16 - 3D Printed!